WASHINGTON, D.C. -- At the Climate Action Summit later this week in California, leaders from around the world will gather to reflect on the progress they've made in combating climate change, but also to focus on their next steps in climate action. 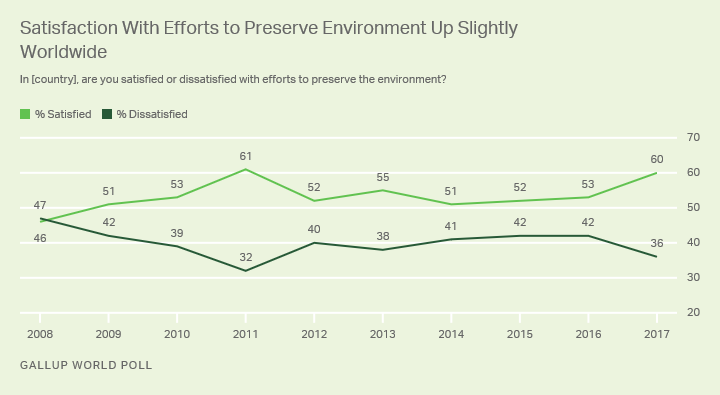 As of last year, worldwide, six in 10 people were satisfied with efforts in their respective countries to preserve the environment -- up slightly from recent years. Line graph: Worldwide satisfaction with efforts to preserve the environment, 2008-2017 trend. 60% satisfied in 2017, 36% dissatisfied worldwide. However, satisfaction varies widely across the world. 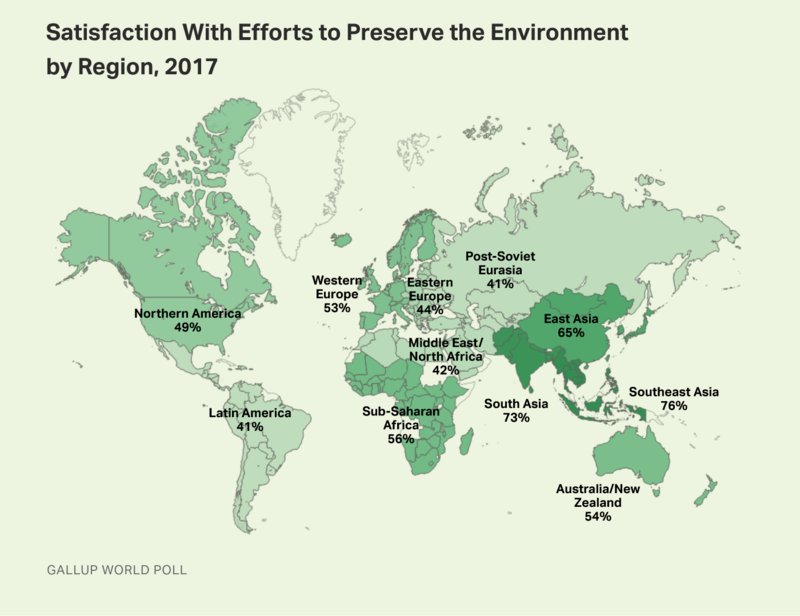 Satisfaction with efforts to safeguard the environment is relatively high in most of Asia -- particularly the South and Southeast Asia regions, where about three-fourths of residents are satisfied. That figure falls to about four in 10 in Latin America and the Caribbean, former Soviet states and the Middle East and North Africa region. Map: Satisfaction with efforts to preserve the environment by region, 2017. Top region: Southeast Asia (76% satisfied); lowest satisfaction: 39% in Middle East/North Africa. In much of Asia, residents have been increasingly satisfied with environmental efforts in recent years. The trend has risen particularly sharply in India, climbing from 54% satisfied in 2014 to 77% in 2017. However, more than two-thirds are also satisfied in Asia's first- and third-largest countries, China (68%) and Indonesia (71%). By contrast, satisfaction has been falling in much of the Americas -- particularly Brazil, where one-third of adults (33%) were satisfied in 2017, down from more than half (55%) in 2011. In the U.S., satisfaction fell somewhat, from 60% in 2014 to 46% in 2016, then remained stable at 47% in 2017. Line graph: In [country], are you satisfied or dissatisfied with efforts to preserve the environment? 2008-2017 trend for four countries. 2017 satisfaction: 77% in India, 68% in China, 47% in the U.S., 33% in Brazil. High satisfaction in India may surprise some, given the country's poor environmental health record. Yale University ranked India 177th out of 180 countries in its 2018 Environmental Performance Index. Recently released 2016 data from the World Health Organization list 14 Indian cities among the world's 20 worst for air pollution. However, the Indian government under Prime Minister Narendra Modi has conveyed that efforts to improve the environment are a priority. 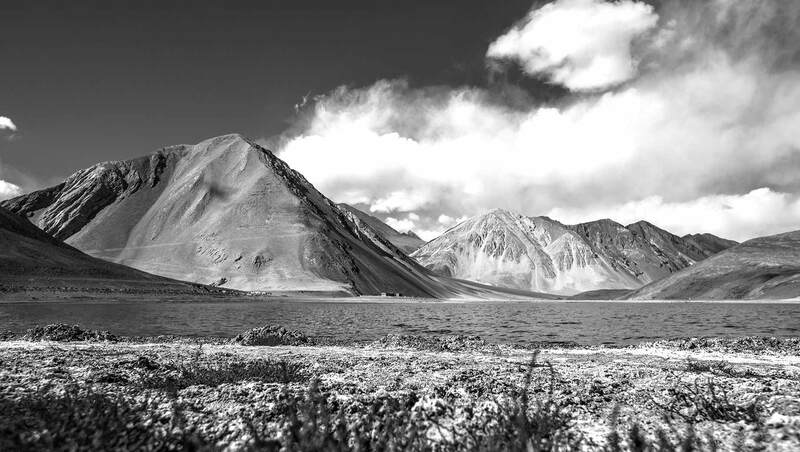 India ratified the Paris Agreement on Climate Change; since then, its federal and state agencies have implemented action plans that put the country on track to meet its target for cutting carbon emissions. Modi has taken a number of other high-profile steps to address India's worst environmental challenges, including pledging to eliminate all single-use plastic in the country by 2022. Environmental Defense Fund President Fred Krupp recently asserted that a "Fourth Wave" of environmental progress is taking place in the U.S. and other economically developed countries. This new phase is characterized by market-based approaches and corporate partnerships, with an emphasis on using technology in innovative ways to harmonize business interests with environmental sustainability. In less technologically advanced regions, however, many countries do not yet have the infrastructure to scale up such innovations. Further, some analysts contend that developing countries benefit economically from weak environmental laws that lower business costs and attract foreign investment -- an idea known as the "pollution haven" hypothesis. Under such circumstances, leaders may find it harder to move past the notion that environmental regulations are at odds with badly needed economic development. The diverging public opinion trends from India and Brazil offer insights in this regard. In India, Modi has explicitly tied environmental protection efforts to the well-being of the country's most underprivileged residents. "Environmental degradation hurts the poor and vulnerable the most," he said in announcing the recent initiative to ban plastic. In taking bold steps to address the country's formidable ecological challenges and arguing that poor Indians will benefit rather than suffer from such efforts, Modi has likely helped boost Indians' optimism about the environment since taking office in 2014. The Brazilian government, by contrast, has rolled back environmental protections recently, with proponents maintaining such moves are needed to boost growth during the country's current economic crisis. However, falling satisfaction with environmental preservation efforts suggests Brazilians are sensitive to the potential harm that may come from these measures, with possible political consequences for lawmakers who supported them. These results are based on telephone and face-to-face interviews with approximately 1,000 adults, aged 15 and older, conducted each year in more than 130 countries. In some countries, such as India and China, sample sizes are larger, between 2,000 and 4,000 adults. For results based on the total sample of national adults, the margin of sampling error ranges from ±2.1 percentage points to ±5.6 percentage points at the 95% confidence level. All reported margins of sampling error include computed design effects for weighting.